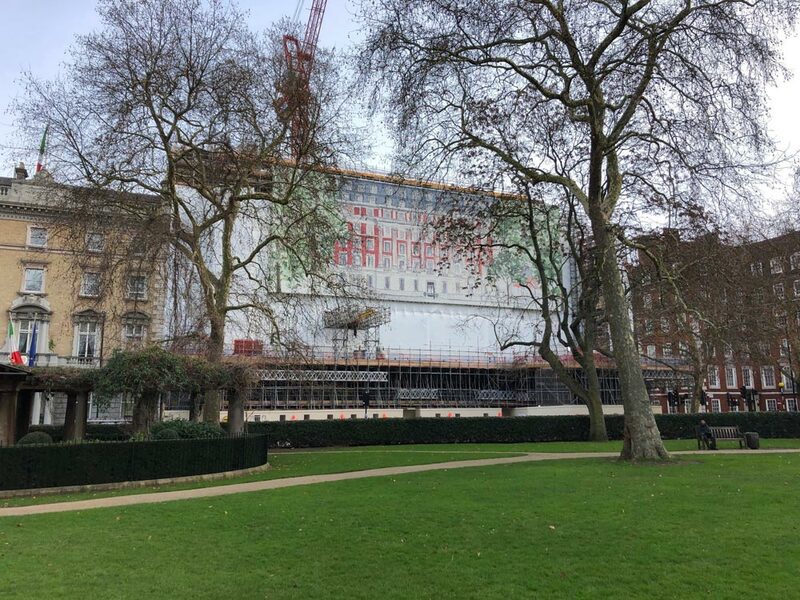 We were asked to supply a large building wrap at Grosvenor Square during the renovation of a heritage building. Lodha Group was our main client, with Mace being their construction partner. This was an important project in a high profile area of London, so this project needed to be of the highest quality finish. Developers tend to prefer banners showing how the building would look after completion. However, Lodha opted for an artistic impression of the uncompleted building instead, commissioned by Aero Studio. Consequently, the design perfectly complements the soft landscaping in Grosvenor Square. This means the development has been turned into a beautiful temporary art installation in the heart of London. Firstly, we had a full scaffold survey conducted to make sure it could hold the weight of the banner. We printed the building wrap on a high quality mesh. We installed the banner in 7 drops, each 4.5 metres wide. The total size when hemmed and welded came in at 12.5 metres tall by 13.3 metres long! Building Wraps are a great opportunity to showcase products and services. They can also conceal works and raise awareness of your brand. Large format prints allow for wide exposure to an audience. They can also keep the area looking tidy whilst reducing disruption to on lookers and residents. 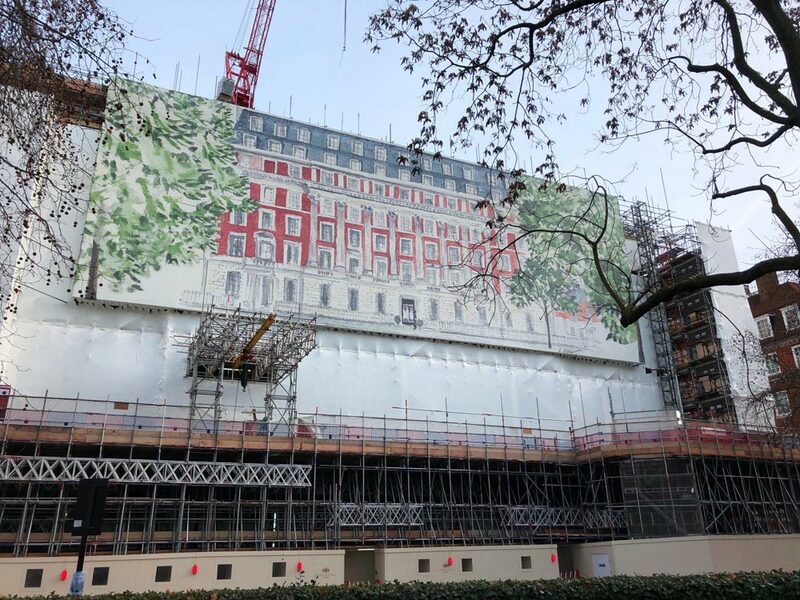 If you are considering installing or designing a building wrap, you can find out more about building wraps from Octink by clicking here. 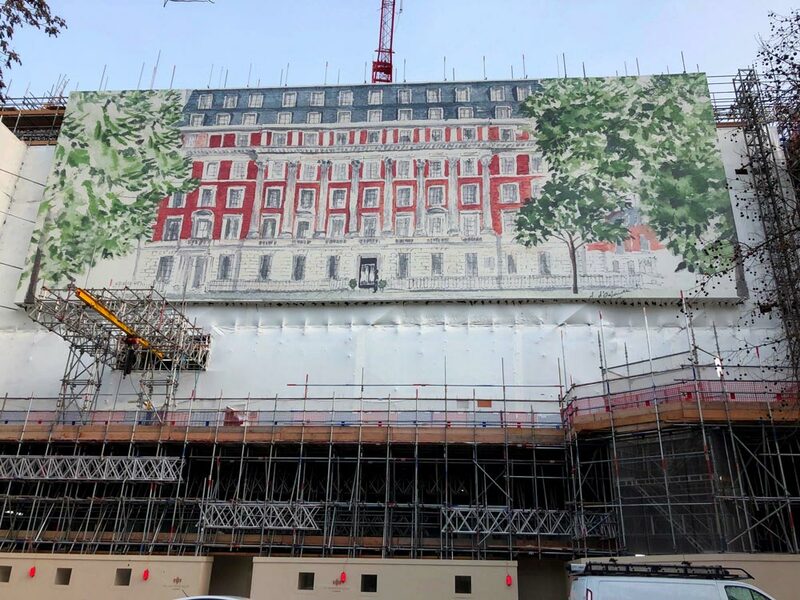 Also, you can read another building wrap case study here.